Perfectly Created Chaos! : Sometimes it all just works. I very rarely sit down to make a card without having some sort of idea or sketch about what I am going to do. Now, having said that, it also very rare that what I end up with is actually what I was envisioning. Usually there's some element that just doesn't work the way that I had imagined. Every once in a while though, all the planets in the creative universe line up and Viola...my imagination turns into a pretty decent piece of reality. Such is the news of today's card. I wanted to do something relatively simple;but with a bit of pizazz as well. I had noticed that Kristina Werner embosses a lot of of her background images, so I wanted to incorporate that here. I used my favorite background stamp "Fine Lace" to accomplish that aspect. It is a bit hard to tell in the picture, but it really is cool IRL. 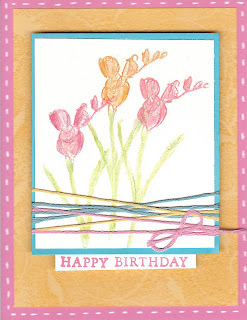 Secondly I wanted to use some embroidery floss instead of ribbon to create another interesting and unique element to the card. I used Versamark and my SU chalks with daubers and blender pens to color the flowers, which are from the retired hostess set "Echoes of Kindness." Finally, a bit of faux white stitching around the edge of the card made it all come together. So, what do you think? That's all for me today, at least creatively. I plan to hop around and see what everyone is up to today, though. Have a great weekend and I'll be back on Monday. Paper: Cameo Coral, So Saffron, Tempting TQ. Accessories: Embossing tools, Blender Pens, Chalks, white gel pen. You are so right, everything did align perfectly with this beautiful card. The colors, layout and image are fabulous together! Oh, I agree, this turned out beautifully! This turned out wonderfully! Great job! Just beautiful! Soft, sutle and great accents! Blessings to you! Gorgeous! I love the coloring job and the color combo chosen - great job!